Think tofu is bland and flavorless? These mouthwatering recipes will change your mind about the soft, creamy blocks of bean curd forever! 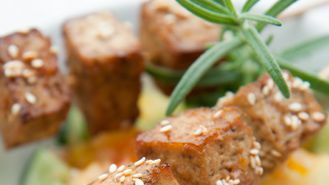 Not only is tofu great for low-cal diets, it brims with good-for-you soy protein, iron, and omega-3 fatty acids. Tofu is also one of the most versatile foods, making it a great base for both savory entrées and sweet desserts. Check out these 10 delicious dishes that are anything but bland! In this unique recipe, slabs of tofu are immersed in a nutty mixture of pistachio and breadcrumbs for a flavor-packed dish with an interesting texture. Preheat oven to 400 degrees; prepare a baking sheet by either oiling it lightly or lining it with a silicone liner. Cut the tofu into 8 1/2-in. slices and dry them lightly with paper towels. Brush both sides of the tofu with the 2 tbsp. soy sauce and set aside to marinate for at least 10 minutes. While the tofu is marinating, place the bread into the food processor and pulse into fine crumbs. Measure out 1 cup of crumbs into a wide, shallow bowl (save any remaining crumbs for another use.) 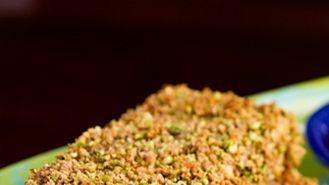 Pulse the pistachios in the processor until they are reduced to fine crumbs. Add them to the breadcrumbs along with a generous grating of black pepper, and mix well. In another shallow bowl, combine the mustard, syrup, soy sauce, and mayo. 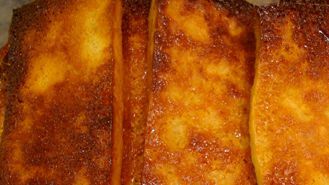 Dip a slice of tofu into the mustard mixture, lightly coating all sides; then place it into the breadcrumbs, sprinkle crumbs over the top and sides, and lightly press them into the tofu. Place on the prepared baking sheet. Repeat with all slices of tofu. Put the tofu into the oven and bake for 20 minutes, or until breadcrumbs are golden brown. Serve with the sauce of your choice. Craving something sweet? Tofu actually makes a healthy base for low-cal desserts like this silky smooth pudding. 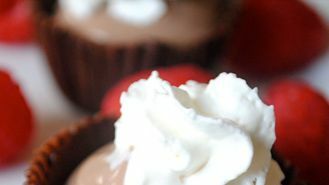 Whip up this tasty treat using chocolate and, of course, lots of tofu, and then spoon the pudding into edible chocolate cups. 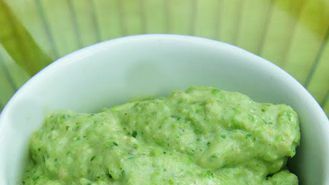 Put all the ingredients in a Vitamix (or blender) and puree until smooth. Refrigerate until ready to fill the chocolate cups (about 30 minutes). Once ready to fill the cups, scoop the pudding into a large zip-lock bag. Cut a small hole in the bottom corner of the bag and squeeze the pudding into the cups. Line 24 mini muffin tins with paper liners. Melt the chips and vegetable oil in a small bowl in the microwave. Stir every 30 seconds and heat until chips are fully melted. Spoon about 1 heaping tsp. melted chocolate into each muffin liner and spread up the sides with the back of a spoon. Put the tin in the freezer to get the chocolate firm. Add a second layer of chocolate to the cups, freeze again. Keep frozen until your ready to remove the paper. Refrigerate the filled pudding cups for about 4 hours, so the pudding sets and gets a little firmer. Top with whipped cream and raspberries. These slightly crispy bean curd strips get a smoky sweet flavor boost with a low-cal blend of sauces and spices. 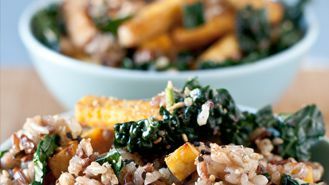 While you can serve them with kale and rice (as pictured), feel free to combine the tofu with other ingredients to round out a healthy, satisfying meal. Drain your tofu and cut into 8 equal slices. Lay the slices out flat on a doubled over kitchen towel with another doubled over towel on top. Lay a large cutting board on top and place a few heavy books on top. Press for 25 – 35 min. Preheat oven to broil with a rack on the top slats. Whisk all other ingredients together in a large bowl. Slice tofu into 1/4 in. wide strips or small squares. Place tofu in the large bowl with the wet ingredients and stir very gently until well coated. Lay tofu out on a parchment-lined pan and broil for four to eight minutes, until golden brown with slightly darker edges. Time varies depending on your oven. Flip and broil for another four to eight minutes until golden brown. Typically, the second side browns a bit faster. Remove from the oven and serve immediately. Crunchy asparagus spears offer a tasty (and nourishing) counterpoint to soft blocks of bean curd, while a drizzle of spicy hoisin sauce lends this dish a surprising kick of flavor. Not only is this meal a surefire way to impress dinner guests, it’s also low in calories and fat. Turn the grill or a grill pan to high. In a small, dry skillet over medium heat toast the sesame seeds until golden. Pour onto a plate and save for garnish. Cut the tofu block in half, then turn one half on its side and cut it in half so that you have two pieces that are about 1 inch thick. Save the bigger half for another use or double the recipe. Set the cut pieces on a clean paper towel and blot dry. In a small bowl mix together the hoisin, soy, Sriracha, and sugar. Set aside. Place the asparagus on the grill (optional: rub spears with a touch of oil) and grill for five minutes rotating the spears until evenly grilled. Divide between two plates. Set the dry tofu on a plate and sprinkle both sides with the five spice. Rub the grill with a touch of vegetable oil on a towel so the tofu doesn’t stick. Place the tofu on the grill and don’t touch for one minute so that it can sear without sticking. Turn the tofu 45 degrees to create the “X” pattern grill marks. Cook 30 seconds. Using a spatula carefully flip the tofu over and grill for one more minute. While it is grilling, brush or spoon some of the sauce onto the tofu. Remove tofu from grill and place on top of the asparagus spears. Drizzle the remaining sauce over each plate (you will have some extra). Sprinkle with the sesame seeds. Who needs chicken nuggets when you can munch on nutritious tofu nuggets instead? 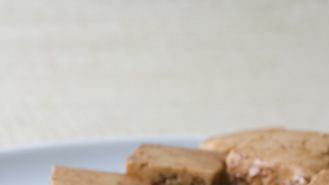 These mealtime treats are easy to make and perfect for dipping into a variety of sauces. Our suggestion? A simply delicious vegan honey mustard spread made from 1 tsp. agave, 2 tbsp. mustard, and 1 tbsp. vegan mayo. Preheat oven to 400 degrees. Take your firm tofu (frozen, thawed, and pressed for better texture), and slice it into 1 in. cubes. Mix vegan “milk”, vegetable bouillon, and mustard together. Dip cubed tofu into the “milk” mixture. Roll it into whole-wheat flour. Dip into the milk mixture again. 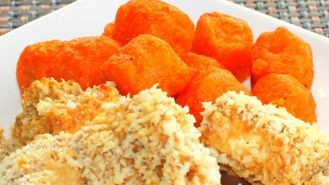 Roll in panko crumbs. Place onto greased cookie sheet. Bake for 15 to 20 minutes. Enjoy with your hot sauce, vegan ranch dressing, ketchup, mustard, etc. 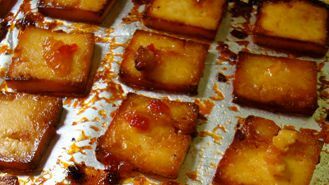 Whether you need a hearty dinner entrée or just want a wholesome snack, these sweet and sour tofu slices make a great option. A mix of sweet jam (like mango chutney) and lemon juice infuse the tofu with an irresistible tangy flavor that won’t interfere with your healthy diet. Mix marinade in a bowl and allow tofu to marinate for at least 15 minutes up to overnight. Bake on a foil-lined cookie sheet at 450 degrees for 20 minutes on the first side (tip: the honey is going to caramelize, so use foil for an easy cleanup). Then, flip and bake for approximately 10 more minutes. Watch the honey because the sugars can burn. Put extras in a container and store in fridge for up to four to five days. Makes 18 long, thin slices. Sometimes all it takes is a handful of great seasonings to make a mouthwatering tofu dish. In this easy recipe, just coat each piece in assorted spices like chili powder, cumin, and cayenne for a spicy dish that won’t even come close to breaking the calorie bank! Coat tofu in spice. In a hot skillet, brown tofu with no oil or water. When edges brown, flip and cover cook until cooked though. Time depends on the thickness of the tofu. Makes 4 4 oz. servings. Who knew that pumpkin butter and honey would make such great accompaniments to tofu? These sweet-tasting slices have a spongy texture and leave you perfectly satisfied. Whisk to combine all ingredients. Marinate the sliced tofu for 15 minutes to 24 hours. Bake on a foil-lined cookie sheet at 450 degrees for 20 minutes and flip and cook another five minutes or so. Note: I used tofu that had previously been frozen, thawed, and pressed. If you love pesto but find it too fattening (thanks to loads of olive oil, pine nuts, and Parmesan cheese), try this creative concoction made with silken tofu and veggies. Find ways to adorn your favorite dishes, such as whole-wheat pasta or pizza, with this delicious sauce, which clocks in at approximately 436 calories per cup. Blanch the peas for a couple of minutes to soften slightly. Wilt the spinach by placing in a colander and pouring over a kettleful of boiling water. When wilted, rinse with cold water and squeeze out as much liquid as you can. Whizz all the ingredients together and season with freshly ground black pepper. This healthy recipe takes only a few minutes of prep time, but the results are tantalizing! Soaking slices of tofu in balsamic vinegar, garlic, and oregano gives the dish some extra bite. Serve with your favorite veggies to round out your meal. Cut tofu into slices. Mix balsamic vinegar, garlic, and oregano together, and marinate tofu for 30 minutes. Grill, bake, or pan-sear.